Genetic mutations that reduce intracellular superoxide production by granulocytes causes chronic granulomatous disease (CGD). These patients suffer from frequent and severe bacterial and fungal infections throughout their early life. Diagnosis is usually made in the first 2 years of life but is sometimes only diagnosed when the patient is an adult although they may have suffered from symptoms since childhood. A 26-year-old man was referred with weight loss, fever, hepatosplenomegaly and coughing. He had previously been diagnosed with lymphadenopathy in the neck at age 8 and prescribed anti-tuberculosis treatment. A chest radiograph revealed extensive right-sided consolidation along with smaller foci of consolidation in the left lung. On admission to hospital he had respiratory problems with fever. Laboratory investigations including dihydrorhodamine-123 (DHR) tests and mutational analysis indicated CGD. 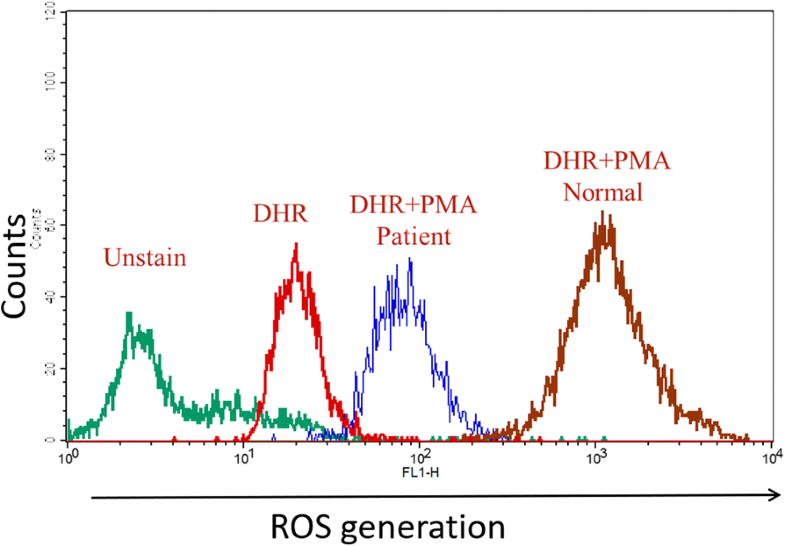 Stimulation of his isolated peripheral blood neutrophils (PMN) with phorbol 12-myristate 13-acetate (PMA) produced low, subnormal levels of reactive oxygen species (ROS). Aspergillus terreus was isolated from bronchoalveolar lavage (BAL) fluid and sequenced. We describe, for the first time, the presence of pulmonary A. terreus infection in an adult autosomal CGD patient on long-term corticosteroid treatment. The combination of the molecular characterization of the inherited CGD and the sequencing of fungal DNA has allowed the identification of the disease-causing agent and the optimal treatment to be given as a consequence. Chronic granulomatous disease (CGD) is a rare inherited primary immune deficiency disorder [1–3]. It presents as life-threatening recurrent fungal and bacterial infections of the skin, lungs and bones with associated chronic inflammation or granulomas. As its name suggests, granulocytes (neutrophils and eosinophils) along with monocytes and macrophages are the major cellular targets. These cells have reduced phagocysis due to defective generation of reactive oxygen species (ROS) which are required to kill selective types of fungi and bacteria [1–3]. CGD is generally diagnosed in infancy or early childhood [4, 5]. Genetic defects in the nicotinamide adenine dinucleotide phosphate (NAPDH) oxidase complex can cause CGD. The 5 structural components that are mutated are the 3 cytoplasmatic components p47phox, p67phox and p40phox and the 2 membrane-associated glycoproteins gp91phox (phagocyte oxidase) and p22phox . As a result, cells cannot eliminate infectious agents due to an inability to produce high levels of ROS. Subsequently, infections such as pneumonia, lymphadenitis, cutaneous and hepatic abscesses, osteomyelitis and septicemia are frequently observed and generally severe in nature . The most commonly found infectious agents include Aspergillus species, Burkholderia cepacia complex, Candida, enteric gram-negative bacteria, Mycobacterium tuberculosis, marcescens and Staphylococcus aureus . In addition, Aspergillus species such as A. fumigatus, A. flavus and A. nidulans are commonly isolated from CGD patients with fungal spondylodiscitis . We describe here a case of autosomal CGD diagnosed in a 28-year-old male. He initially presented with granulomatous disease mimicking sarcoidosis and was treated with corticosteroids for 12 years. On admission to hospital he had respiratory problems with fever, and laboratory investigations including dihydrorhodamine-123 (DHR) tests  and mutational analysis indicated CGD. Aspergillus terreus was isolated from bronchoalveolar lavage (BAL) fluid and its presence was confirmed by sequencing. A 26-year-old man with a history of consanguineous parents (cousins) was referred with weight loss, fever, hepatosplenomegaly and coughing. He had previously been diagnosed with lymphadenopathy in the neck at age 8 and prescribed anti-tuberculosis treatment. At 12-years of age he was diagnosed with pulmonary sarcoidosis and corticosteroid treatment was initiated. On examination on the day of admission to our hospital the patient was pale with low-grade pyrexia (37.5 °C). Cardiovascular examinations were normal but he had cervical lymphadenopathy. A chest radiograph revealed extensive right-sided consolidation along with smaller foci of consolidation in left lung (Fig. 1a). Crackles were heard on the left side. Moxifloxacin treatment for 2 weeks did not alleviate his cough, hypoxia or night sweats and fevers of up to 40 °C. Thoracic computed tomography demonstrated mediastinal lymphadenopathy and bilateral consolidation that was greater in the right lung. Non-specific inflammation was shown in a lung biopsy (Fig. 1b and c). Full blood counts were normal and liver function tests and autoimmune and virology screens were negative. Whole blood was examined with specific laboratory tests for neutrophil NADPH oxidase activity i.e. nitroblue tetrazolium (NBT)  and DHR tests [10–14]. Low, subnormal levels of ROS were produced following stimulation of purified peripheral blood neutrophils (PMN) with phorbol 12-myristate 13-acetate (PMA) (Fig. 2). BAL and serum galactomannan (GAM) tests were negative but the BAL sample was sent for microbiological analysis. 48-72 h culture of the BAL sample on sabouraud dextrose agar at 30 °C resulted in the appearance of smooth light yellow powdery colonies that became darker over time (Fig. 3a). Lactophenol cotton blue (LPCB) mounting medium slide culture was performed for microscopic species identification (Fig. 3b and c). Microscopic analysis revealed septate and hyaline hyphae with biseriate phialides extending from the upper portion of the vesicle and covering 2/3 of the plate. Hyaline, globose or oval and thick-walled chlamydoconidia were also seen (Fig. 3b and c). The isolates were identified by phenotypic (macroscopic and microscopic) characteristics as Aspergillus terreus, and this identification was confirmed by DNA sequencing. The fungal culture was disrupted with glass beads in a grinder and DNA was extracted with phenol chloroform. DNA was suspended in 50 μl of double distilled water and stored at − 20 °C for future use [1, 2]. The beta tubulin gene was amplified with forward (Bta2a: 5′-GGTAACCAAATCGGTGCTGCTTTC-3′) and reverse (Bta2b 5′-ACCCTCAGTGTAGTGACCCTTGGC-3′) primers and sequenced. The DNA sequence results were compared against the NCBI Genebank database, which showed a 99% similarity with an Aspergillus terreus isolate in the Gene Bank fungal library with accession no 1168 [15, 16] (Fig. 4). Genomic DNA was extracted from the blood mononuclear cell fraction using a Gentra Puregene Kit (Qiagen, Hilden, Germany) according to the manufacturer’s instructions. DNA sequencing was performed at the Sanquin Research Laboratory (Amsterdam, The Netherlands). GeneScan was used to determine the ratio between the number of exon 2 sequences of neutrophil cytosolic factor 1 (NCF1) gene, which encodes p47phox, and the number of Ψ-NCF1 exon 2 sequences . This revealed a homozygous GT deletion (c.75_76delGT) at the start of exon 2 in NCF1, resulting in the introduction of a frame shift and a premature stop codon (p.Tyr26HisfsTer26) predicting a truncated and inactive p47phox protein. The patient was treated with meropenem, vancomycin and liposomal amphotericin b for 2 weeks. After obtaining the results of fungal characterization, voriconazole was started and other antibiotics were removed from the treatment strategy. After 3 months, the patient had recovered as confirmed by chest imaging and clinical manifestations. The patient gained 10 kg in weight and is on maintenance treatment with voriconazole. We report here an adult autosomal CGD subject with pulmonary A. terreus infection. We are unaware of any previous cases describing pulmonary A. terreus infection in an adult on long-term corticosteroid treatment. We combined molecular identification of CGD mutation with fungal DNA sequencing to correctly identify the causal agent and consequently provided optimal therapy for the patient. In the first 3 months of treatment the patient gained 10 kg in weight indicating the success of the diagnosis and treatment. Most pulmonary fungal infections in CGD patients are due to A. fumigatus although A. terreus can cause pneumonia and disseminated infections in man [18–25]. In humans, A. fumigatus, A. flavus and A. niger are much more common pathogens than A. terreus  although A. terreus has been associated with vertebral infections [26–29]. Immunocompromised individuals are at most risk of opportunistic infection by A. terreus. These patients include COPD patients on corticosteroids, cancer patients receiving chemotherapy and patients with HIV/AIDS [29–31]. It is likely, therefore that the A. terreus infection seen in this CGD patient with an inherited defect of PMN function and on long-term treatment with corticosteroids was opportunistic. The incidence of A. terreus has risen from < 2% in 1996 to 15% in 2001 . The resistance of A. terreus to amphotericin B, thermotolerance and the production of accessory conidia have been proposed as mechanisms that explain the rapid dissemination of the organism during invasive infections . A. Terreus is an opportunistic fungus with an increasing prevalence amongst aspergillosis species and has a higher mortality rate (51% versus 30%) compared to other species [34–37]. A. Terreus infection often leads to superficial infections in man whereby the inhalation of spores initiates the immediate recruitment and activation of macrophages and neutrophils that overwhelms the infection . However, in immunosuppressed individuals with neutropenia, or with a compromised capacity for neutrophil phagocytosis, this response is less vigorous . Most CGD patients are susceptible to opportunistic infections. Indeed, the most important symptom of this disease is recurrent and/or invasive infections, especially those caused by catalase-positive bacteria and fungi. In Western countries, about 30% of CGD cases have been reported to be autosomal recessive (AR), of which the majority is due to mutations in NCF1 [5, 40]. However, in a recent multicenter study conducted in Iran, the majority of CGD patients were found to be AR (87%) and only a minority had X-linked CGD (13%) . It is important in regions where tuberculosis is endemic, such as Iran, that sarcoidosis and CGD are considered as differential diagnosis. The demonstration of successful patient-orientated treatment after using sequencing to confirm CGD and proper microbiological methods to identify the presence of specific infectious agents emphasises the importance of adopting this approach across the region. IMA is supported by the Wellcome Trust (093080/Z/10/Z) and by the Dunhill Medical Trust (R368/0714). All data obtained is presented in the manuscript. No additional datasets were generated or analyzed in the current study. EM, IMA and PT were involved in the study design and data collection and had full access to all of the data in the study and take responsibility for the integrity of the data and the accuracy of the data analysis. EM, PT and SS wrote the initial draft of the manuscript. KvL and DR conducted the sequencing analysis. SS, MM, AM and EM conducted the clinical and laboratory tests. EM, SS, MM, AM, DM, PM, KvL, DR, JG, IMA and PT were involved in data analysis and interpretation, reviewing the manuscript and providing critical feedback and assessment. All authors have seen and approved the final version of the manuscript. Patient consent for case report publication in journal and has signed consent form.